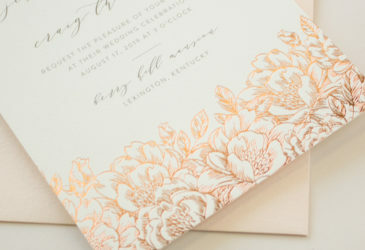 Foil stamping is an artisan printing method where a heated die is used to press a sheet of thin metallic foil to paper. 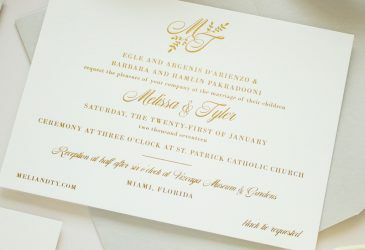 The result is a pressed design with a shiny finish, producing gorgeous foil wedding invitations. 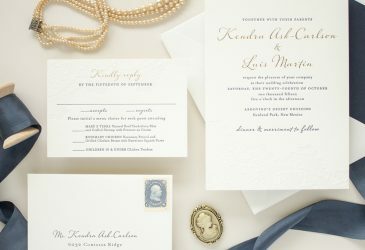 Like letterpress, a custom die is made, and paper is pressed one piece at a time. 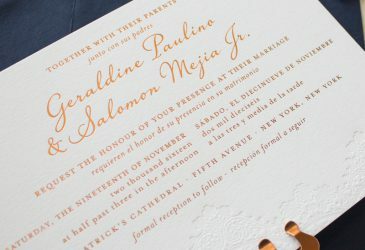 However, foil is shiny and opaque, (as opposed to letterpress inks that are slightly transparent) which means it can be printed on dark papers with no show through. I offer four metallic foil colors: gold, silver, rose gold, and copper. Other colors (like white, shiny black, or bright pink) are also available. What can you print with foil? 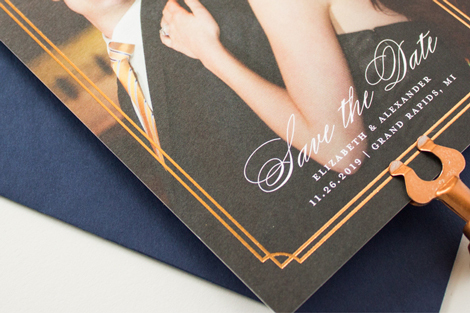 Foil stamping works best on minimal designs without delicate lines or large areas of color. 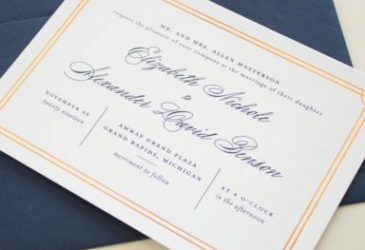 I offer foil wedding invitations, inserts, envelopes, save the dates, and day of stationery. This collection showcases designs that truly shine in foil! I'm also happy to adjust other designs to work with metallic foil printing. 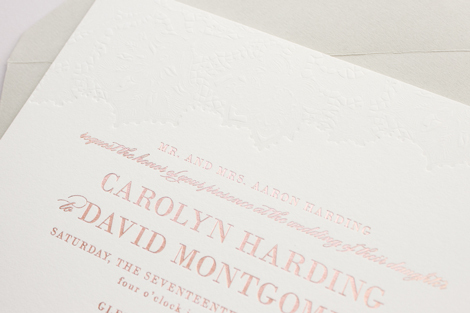 Foil pairs beautifully with letterpress or flat printing. 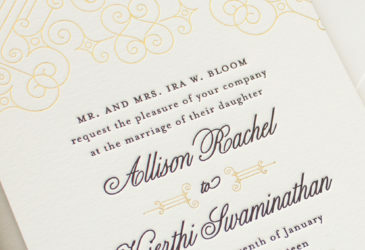 Add a touch of gold foil to blind letterpress, or stamp some shiny copper foil over your flat print photograph. You can learn more about the foil stamp technique on the blog. I love to work with foil- schedule a consultation to find out how we can incorporate foil in your design! 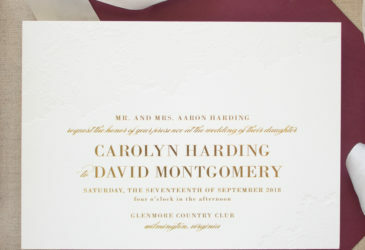 Browse the foil wedding invitations below. Click on any design to view additional photos and see coordinating pieces. All designs in this collection are also available in flat printing or in letterpress.